This compact kickstand design is made for your lowered or stock height Honda ruckus. Simple from the outside yet in contains a spring loaded ball bearing locking mechanism on the inside. Powder Coated Gloss black and Made 100% in America. If you have a lowered Ruckus picked lowered kickstand. Stock height with stock front forks should pick Stock Kickstand. 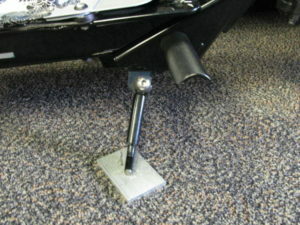 This compact kickstand design is made for your Lowered Honda or Standard ruckus. Simple from the outside yet in contains a spring loaded ball bearing locking mechanism on the inside. 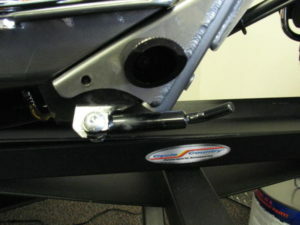 Has REAL foot not just a bolt to prevent tip over. Powder Coated Gloss black and Made 100% in America with American Hardware. If you have a lowered Ruckus picked lowered kickstand. Stock height with stock front forks should pick Stock Kickstand.